Maureen's verbal description of how she made the rings on a square laid ground: "The circular filling is easy. Depending on the size of your threads and the area you want to fill. You first of all lay a grid. This is a case of laying two threads close together (approximately quarter of an inch if you are using a thickish thread like 60 crochet cotton, but about half that if you are using a finer thread) from the top to the bottom. The next stage is to leave a space of about half an inch and then lay another two threads close together from top to bottom and continue like this right across the space you are filling. Then you repeat the exercise but laying the threads across the space from left to right but as you reach as vertical threads you inter-link the thread so that the squares are linked together. Once you have done this, at each square, you then weave a thread around the square to create the padding probably about 6-8 times. Then buttonhole tightly covering the padding around the square creating a circle with a small hole in the middle. Once you have completed the buttonhole, join your outer edge of the buttonhole up by taking your needle through from the back to the front and then run the needle through the back of the stitches to finish. Each buttonhole ring should be started and finished independently. It might be easier to do this with a sharp needle so you can loose the end of the thread easily. Again a diagram might be in Lorelei's section, and I am sure she will confirm this. I hope you can understand this but if not, then ask. I will do my best to answer your questions. Have fun. " Karen Roy's diagram of how to add little wheels to a single Brussels ground. So lets each try a few of these methods, post photos as we work, and discuss pitfalls, advantages, etc. Also post size of pattern and threads that you use. There is no need for all of us to work the exact same stitches, or to use the exact same pattern. If we each try several variants, and describe how we did them, we will end up with a useful tutorial that can be referred to in the future. Have I left anything out? What about proper names for these things. Are there proper names? This looks like fun! Just the thing to jumpstart the needlelace again this year. Hope to see many of us try this! I will immediately post my point de gaze roadrunner (Nancy Evans design) that I worked in 2013. The eye was a ring that I added a couple of stitches across to make the center of his eye. I have too many projects just started and not finished, so all my little pads are in use. I'm going to take an ugly sampler and use it for this experiment. When I get one section done, I'll post it. Same here. I'm getting better at posting. I sketched for a bit at work today and hope to have a little down time tomorrow to finish up something fun for a sampler. Hope to share it! Hello! 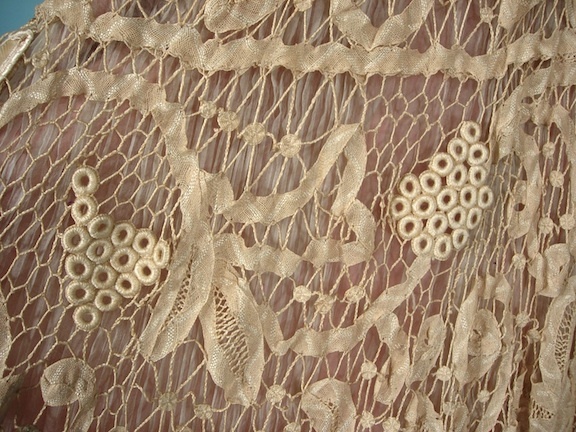 I just found a picture of some Battenberg Lace from 1905 which shows an interesting take on circles. Check out this detail photo. It looks like the maker did a fairly wide ground using twisted Brussels or Point d'Espagne (or even more twists than that, since it's a large-scale lace used to make a whole jacket), then built up rings on the ground on adjacent hexagons. The result is a cluster-of-grapes effect that is quite beautiful. I can't tell whether the rings were made separately and then attached, or made directly in the ground as I diagrammed here, but either way would work to get the grapes. Morning Karen, yes, this is a stunning piece with an ethereal quality. Patricia Girolami also has an interesting way of doing grapes. I don't know whether you've seen her photos? Love the idea of doing grapes, wisteria or laburnum for future projects. Tx for posting this. Usually, these rings for grapes and wisteria in Battenberg are all worked separately. They can be worked on a stick (most common) or on a pad. 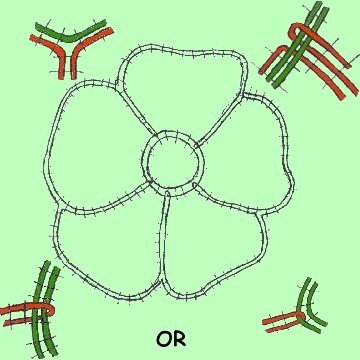 After the individual rings are worked, they are attached to form the pattern. I believe at one point, one could order pre-made rings! Don't remember the catalog, but remember it from researching days many years ago. Some folks love to do those rings. Laura. Thanks for providing the answer, appreciated. How are you getting on with your circle design? It's coming along, slowly. I've been working on some other projects so it tends to get time less often. I've filled the border with corded buttonhole and worked a couple of the tiny rings with little experiments. I'll post them next time I'm working on it. Lots of fun thinking about it, though! Looking forward to seeing it in progress. I'm spending too much time thinking currently instead of actually doing the stitching! I need to trust my initial gut reaction instead of overthinking it. Isn't that the truth!!! I even had this silly pattern in my dreams before I actually started working. It's best to just pick it up and start. Although my doodle page of ideas for each circle has certainly grown to a couple of pages. Sometimes we just have to do it! Have fun working!